A composition of three fetal skeletons standing on a rock formation made of kidney, bladder, and gall stones, with vascular trees in which a small bird is perched. The uppermost skeleton is that of a four-month female fetus and holds a string of pearls in her hand. The skeleton on the left holds a miniature scythe. The skeleton on the right is holding a string of calculi, and weeps into a mesentery.--Cf. Rifkin, B. Human anatomy, p. 153-154. 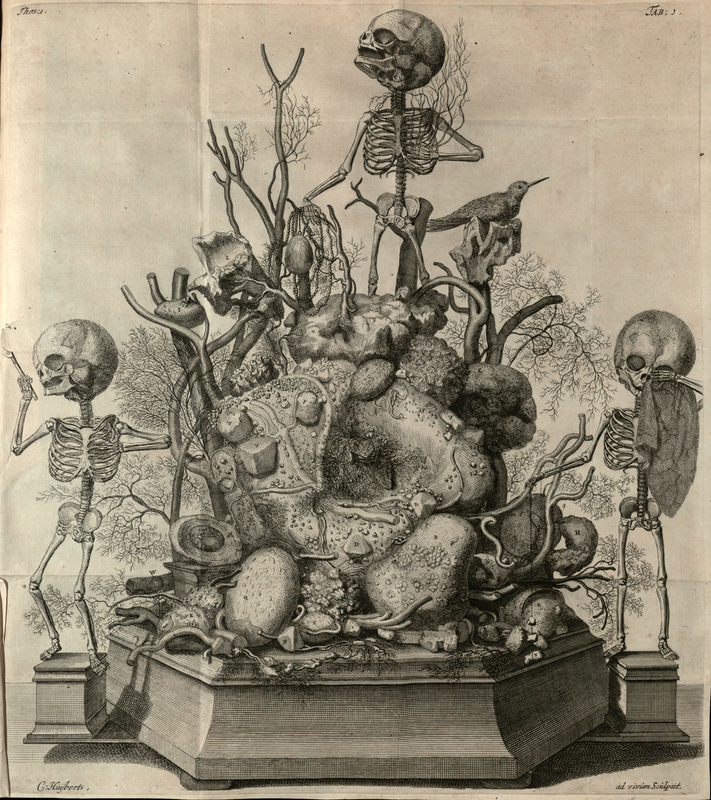 Huyberts, Cornelis and Ruysch, Frederik, 1638-1731, “A composition of three fetal skeletons,” The College of Physicians of Philadelphia Digital Library, accessed April 24, 2019, https://www.cppdigitallibrary.org/items/show/1506.